Disney’s Wilderness Lodge Resort will transport your theme park vacation into a mountain retreat. The northwestern themes abound and you will lose yourself in the rustic decor. A stream winds through the lobby and pours out to the courtyard and empties into the pool, a geyser erupts around the clock. A cool, rainy day will not be lost as you can curl up by the fire with a book. The Wilderness Lodge is a great place for romantics and families alike! 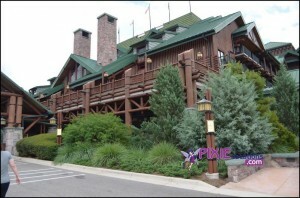 This is considered a Deluxe Resort and will run between $265-450 per night depending on your travel dates. Roaring Forks: A quick service dining location offering snacks, flat breads, sandwiches, salads, burgers and more! Eat in the small indoor dining area or take your food outdoors to enjoy the scenery! Roaring Forks is open for breakfast, lunch and dinner. Whispering Canyon Cafe: This is a table service location that offers up home style eats like ribs, chicken, and pulled pork. Family style skillets are offered for breakfast, lunch and dinner. The best part of this location is the entertainment. The waitstaff will not fail to entertain! Artist Point: This is a signature dining location, meaning it is at the top of the dining options food chain. This meal will cost you two table service credits if you are on the dining plan. The restaurant offers up Northwestern fare such as salmon, buffalo, and swordfish. Dessert offers a berry cobbler that is a wonderful mix of flavors! Artist point is open for Dinner. Territory Lounge: Grab a few drinks and some appetizers in this cozy bar located near Artist Point. Trout Pass Pool Bar: If a frosty drink and a pool chair sound like a good way to pass the time, head to trout pass located near the main pool. Limited snacks such as chips and pretzels are also available. Recreation: The Wilderness Lodge offers up a variety of recreation options. With two pools and a beach you can certainly catch some rays or go for a swim (you cannot swim in the lake, only in the pools.) However, your recreation choices do not end there. Other good things to note is that if you take a walk down to the beach around 9:35 pm you will see The Electric Water Pageant go by. Transportation: Boat service is available to The Magic Kingdom with a stop at the Contemporary Resort using the Red Flag boat. On the Blue Flag boat you can get to Fort Wilderness. Bus service is available to Epcot, Magic Kingdom, Animal Kingdom, Hollywood Studios and Down Town Disney as well as both water parks. Quick Review: This resort offers a cost effective way to stay deluxe. While not priced like its Magic Kingdom Resort counterparts, it is rightly ranked a deluxe resort. Services and amenities are plentiful. Families and couples will love how much this resort has to offer and appreciate the vacation within a vacation as they walk through the doors into the lodge. The boat to the Magic Kingdom is a wonderful option for getting to the park, but the real value in it lies in leaving. When monorail and bus lines are long often there is little wait for the boat! A great resort for a relaxing vacation. This entry was posted in Deluxe Resorts, Resort Spotlight and tagged Artist Point, boat, Deluxe Resort, electric water pageant, Roaring Forks, Whispering Canyon, Wilderness Lodge. Bookmark the permalink. ← Fantasyland 2.0 Coming Soon!